On Colonization–-Ants and Chávez, both of which I can see from my balcony. Look, our rental agent pointed over the balcony. You can see Venezuela from here on a clear day. I felt smug, as smug as Sarah Palin in a Nieman Marcus suit as I looked over the Caribbean Sea toward Venezuela, from a balcony in Curaçao. We’ll take it! I shouted. Not long after we move in, ants colonize the apartment. I blame my husband for bringing them home from work (he did). I blame our landlord because we have no hot water (we don’t). I blame the windows being open (we will suffocate if we close them). I blame the stagnant water in the shower, the sink, the puddles after a thunderstorm. I blame the garbage, my husband for generating the garbage, the cat litter, the cat. I Windex the ants in their endless armies, wiping up thousands in one sheet of Bounty. But still they come. They come no matter how much Windex I squirt, no matter how much I drown them, trap them, squish them with paper towels, my fingertips. They come and they keep on coming, marching straight from the balcony to the cool gray tiles of our new apartment. Meanwhile, Hugo Chávez is rumored to be boosting his reserve army. Is he anticipating the October dissolution of the Netherland Antilles when Curaçao becomes independent from the Netherlands, and planning to march right on in? Or is the gossip just part of the oral scare tactics lobbed at the American presence there? Where there is change there is uncertainty, and where there is uncertainty, there is usually a tyrant. The nebulously forming governance of Curaçao is likely to be uneventful, as it will be under the Mothership’s genteel directive for some time. However, with the handover less than one week away, it is still unclear what Curaçao will even use for a monetary unit, never mind how to handle unhinged South American blowhards. Curaçao is about 40 miles from Venezuela’s coast, contains a natural and large deep water port, and hosts a massive oil refinery, ISLA, which is owned by the Dutch government and leased to the Venezuelan state oil company, PdVSA. The adjacent tank depot holds somewhere around 16 million barrels of crude and is Venezuela’s central staging platform for oil shipments to China. For years, Chávez has been saber rattling, convinced the American Air Force installation (FOL – Forward Operation Location) in Curaçao is planning an invasion on his country, or at a minimum, spying on him. The FOL, presumably, is there to assist with counter-drug trafficking efforts in the region. In an endless cycle of threats and buffoonery, Chávez often states he will stop refinery operations if the FOL isn’t kicked off the island. The tenuous threat, unlikely to unglue the NATO bond between the Netherlands and America, feeds into local fears, to the point that a political opposition party formed around the desire to gain complete independence from the Netherlands, and even agrees with Chávez’s anti-FOL sentiment. In addition, political sources here say opposition parties receive significant funds from Venezuelan sources. Add to the hotpot, the Build, Own, and Operate plant (BOO) that produces electricity for the refinery (and the country), is often unable to supply ISLA with enough power to operate. From what I understand, the refinery workers, frustrated, go on strike and island rumors whip around faster than a hurricane heading toward Florida; people hear and believe that Chávez has closed the refinery. Before the end of the day, gas stations have run out of fuel and people are buying candles by the dozen. Of course Chávez does nothing to dispel the rumors. 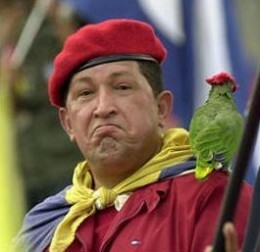 Ah, but will Chávez bite off his nose to spite his face? The refinery is one of few that can contend with the oil that Venezuela’s Maracaibou Basin produces. And, with its close proximity to Venezuela, deep port, oil rig and ship repair capacity, access to markets afar, is Curaçao an asset Chávez can afford to give up? In the past, the refinery was a prodigious employer, but recently, hampered by an aging facility that is largely unprofitable and damaging public health and the environment, it is becoming a liability for the tourist-seeking island. So why not just get rid of him and his haphazard oil diplomacy? Tyrants are usually not predictable. He could possibly blow up the refinery, in a “if I can’t have it then you can’t” fashion, like Saddam did in Kuwait years ago. He could start a war, convinced that the small Dutch military stationed here and the American FOL would be caught by surprise. Or, perhaps while the newly formed government is learning to tie its shoes, Chávez, like my ants, will try to find the smallest crack, the weak link, in which to slip through, unencumbered by the powers that menace him. If he can throw enough money to opposition parties, create enough fear, and make the refinery a necessity, rather than a liability to the island, he just may forge an unimpeded passage through these vast waters. With proximity on his side, fuzzy governance, and an American administration that would rather avert a fight, it’s the perfect trifecta for a victor seeking enemies of convenience, targets for despotism, anti-Western rhetoric, and unhampered transit for a deluded vision. While Chávez watches Curaçao, I’m watching him (or at least the mountains of Venezuela) while I zap row upon row of ants, marching along the grout lines. I am slowly killing them all because they are so busy with their own priorities, they don’t see my Windex nozzle staring them down. Meanwhile, if the power goes out because it is being usurped by ISLA, I will consider buying a windmill to generate my own electricity and use it to blow the pesky ants into the sea and the smoke from the refinery along with them. I woke up thinking I hadn’t heard from you in awhile. I wasn’t worried; I just missed you. But now I am worried. Last time I read your blog it was in the wee hours as I tended to my son after his surgery. Your shoe post saved me. Distracted me into visions of lovely shoes lined up in my closet. And now I want to fly you here and put you in my youngest son’s now deserted bedroom (he’s now in grad school in London) and keep you safe from invading ants and tyrants. Followed Darrelyn here. Happy I did, though sending condolences over those ants. Have heard that mixing half vinegar and half water and spraying areas where ants walk will get rid of them. Also baby powder! Sprinkle powder on ants – it upsets them – they go back to nest and don’t come back. Haven’t tried any of these remedies since no ants here, but hope it helps!